Peek-A-Boo covers is one of the best places to go when you are after an adorable but well functioning custom car seat cover, soaker pad, infant seat canopy cover and more. I love handmade items and Peek-A-Boo covers are all handmade by the owner Paulette. Paulette is the married mom of five children ages 2 through 10 and they keep her busy when she is not sewing and creating her covers. She is a nurse by trade but has chosen to stay home and raise her babies. She tells me that her favorite item is her soaker pad because it helps so many moms. (We all know how little leaks can sneak up on us). Her inspiration is the gospel, family and her husband of 14 years. Her wonderful husband inspires her to "just go for it!" When she is not crafting and sewing she does enjoy working in her yard and planting flowers, the beauty of nature is one of her many passions. Peek-A-Boo Covers began just two years ago, it all started when she made her first canopy cover for her fifth child, they were playing peek-a-boo with it and that's where the name began. 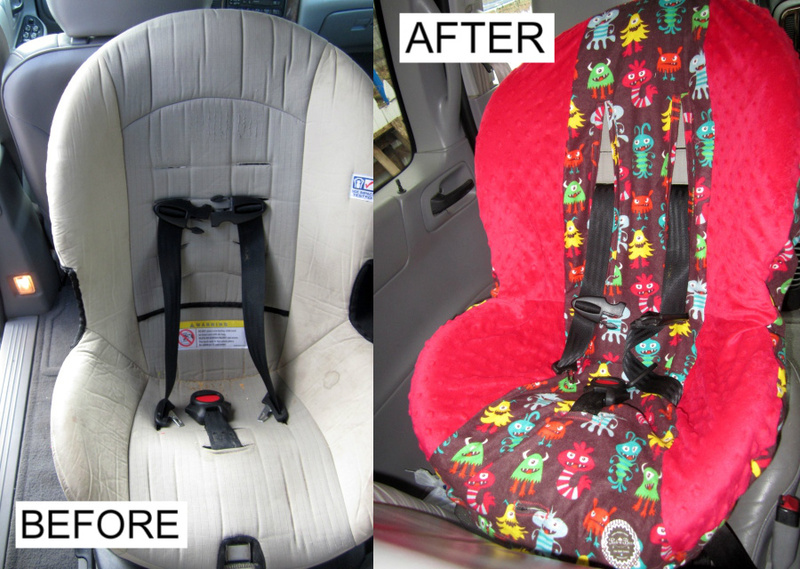 Check out the transformation of my youngest child's convertible seat below! What a difference huh?! Oh yes, it is colorful and exciting plus easy to remove and wash (gently on cold cycle and hang to dry). My son is 18 months and the bright fun pattern really stimulates his creativity, he was really excited to hop into his seat the day I put the cover on it. When you place your order with Paulette you will get to choose from a wide variety of fabrics that she has available to her, you get to personalize your item! There are so many options and you are sure to find just what you are looking for and if not don't be afraid to ask. Peek-A-Boo Covers is a proud sponsor in the Spring Buzz Giveaway Hop that I am participating in. She will be giving away (on my blog) a custom soaker pad and strap covers, winners choice! The event begins on March 22nd and ends March 27. *mention that you saw this review and get 10% off your order! Special thanks to Paulette of Peek-A-Boo Covers. Disclaimer: I purchased this item at a discount for the purpose of review. All opinions are my own.